As far as prefab and modular homes go, one of the most readily available uses for them is community living parks. And probably a lot of people prefer living nearby other people in this type of setting, rather than on their own for long stretches. Anyway, this prefab cabin can suit community and solitary (put it anywhere on any land) living. Features of this prefab home: one bedroom, big enough for a king-sized bed; a kitchen slash living room, big enough for a sofa that can sleep house guests. The kitchen on this park model unit is an L-shaped one with cook tops, fridge, mic, dishwasher, and the counter tops are granite. The builder of this prefab home is Wheelhaus. This size of prefabricated house fits on a not-too-big trailer and can be towed onto any site, whether to sit on a flat foundation, a basement, or simple blocking. As you can see from the picture, the design is simple and wedge-shaped, and it’s an unimposing design, so having a lot of similar units nearby has a clean effect. 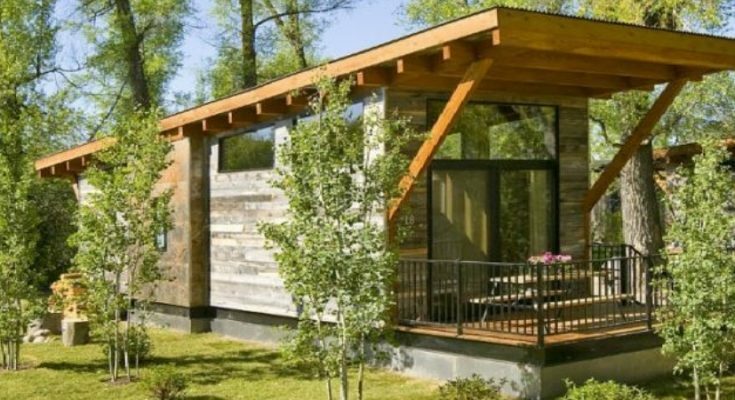 It’s kind of “rustic cabin” aesthetic because of the weathered wood siding and other exterior wood impression, but it’s also a modern design because of the minimalism, simplicity, and eco-friendliness. It has ceilings up to 17 feet, windows near the top of the ceiling for plenty of natural lighting, a timber-frame roof, and an outdoor deck. these prefab home park models list for around $82,000 and up. 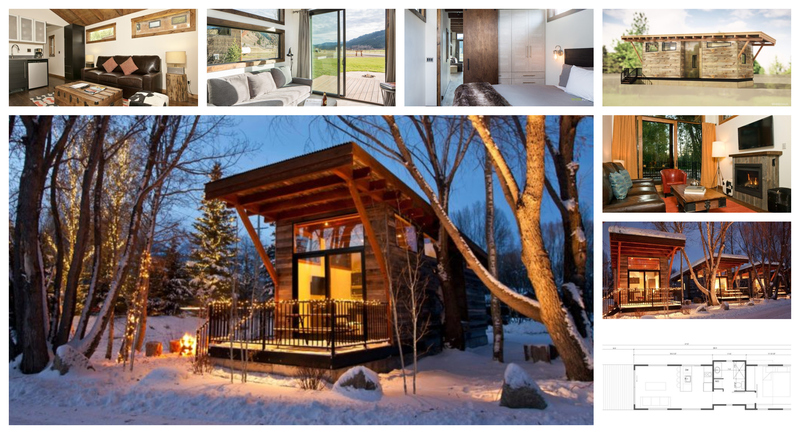 However, I understand that might be out of the price range of some of our readers here, so to see more of Wheelhaus’ work, or to find work by other prefab and modular home companies just to check out and find more about them, find them in the Building Homes and Living directory.